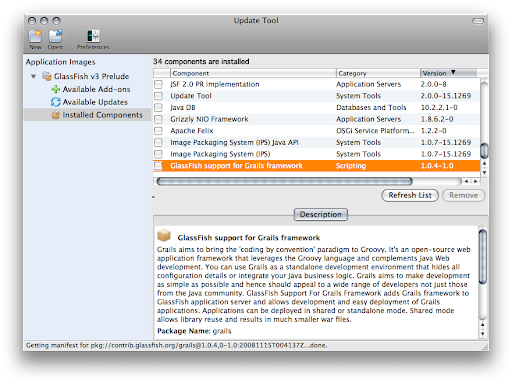 My colleague Matt wrote a brilliant tutorial: EJB 3.1 and JSF 2.0 with GlassFish V3 Prelude. A commenter on Matt's post claimed that using Grails to create the same application would be a tremendous simplification. I wanted to find out if this was really true, and how much effort it would actually take to achieve the same functionality with Grails. 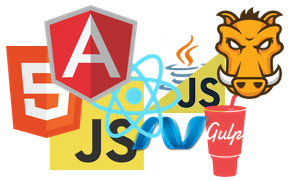 This post is not a Grails tutorial, and it is also not the goal to create an intelligent application. The goal is to reimplement Matt's application as efficiently as possible. I assume, that you have GlassFish V3 Prelude installed. Start the updatetool or start glassfish an go to the updatetool inside the admin console. Select Grails for installation and perform the installation. Set the environment variable GRAILS_HOME to point to the Grails installation inside GlassFish, and include the Grails binary in your PATH. Execute grails create-app CRUD-GRAILS in on the console. This creates a directory named CRUD-GRAILS with a fully functional Grails project skeleton. You can start your new Grails project with grails run-app. This starts up GlassFish and loads the application. The application is available at http://localhost:8080/CRUD-GRAILS. As you can see there is not much there apart from a welcome screen. Execute grails create-domain-class book from inside your project directory. This creates the file grails-app/domain/Book.goovy that contains a skeleton class for the book entity. Execute grails create-controller book from inside your project directory. This creates the file grails-app/controllers/BookController.goovy that contains a skeleton class for the book controller. That's basically it! The application can create, update, show and delete books. It took typing three commands and writing three lines of code ... all completed in less than 10 minutes ... not bad I would say! ... now you can look at the code and adjust it to your needs.